Can you play M4V on Android? I have some movies in .m4v format and I want to play them on my Android tablet. My tab stopped responding and it couldn't play these M4V files anyway. Does anyone know there is an M4V player for Android that is able to play M4V on Android phones or tablets? If you have M4V files from iTunes or iPhone iPad, and now you'd like to play them on your Android devices, it's frustrating that your Android built-in video player won't cut it. M4V isn't on the list of Android supported formats. 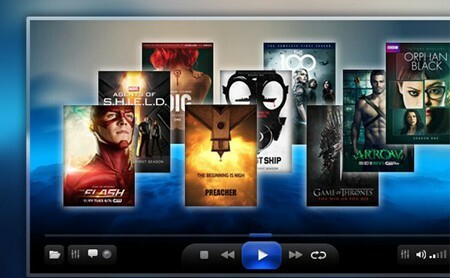 But there are many third-party M4V players for Android you can free download to let M4V files play on Android devices. Try these free M4V players for Android without the need to install an M4V codec pack. 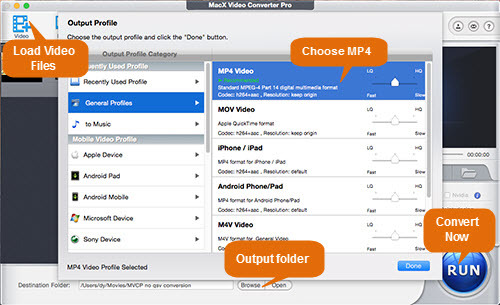 Free download the M4V converter for Mac, MacX Video Converter Pro, to convert unplayable M4V files to Android supported formats, MP4, AVI, WMV etc. and play M4V files on Android without additional M4V player for Android or a M4V codec pack. VLC, one of the most popular free open source media players, has an app version for Android. It's quite easy to play M4V in VLC. In fact, VLC allows users to play a wide range of formats, including M4V, MKV, MP4, AVI, MOV, M2TS etc. All M4V codecs are included within the app, without the need to download any additional codec pack. The M4V player for Android supports SRT subtitles, Teletext, multi-track audio, auto-rotation, aspect-ratio adjustment, and more. It is also one of the best M4V player for Mac. However, many users report bugs due to the latest update - the M4V player app for Android won't close even when users force close it. BSPlayer Free for Android is a good M4V player for Android that is compatible with Android 6.0. It supports hardware accelerated M4V video playback on Android phones and tablets, which helps reduce battery consumption. M4V playback speed is improved with Multi-core HW decoding. Other features from the best M4V player for Android phones and tablets include multiple subtitles and audio streams, support for USB OTG, and uncompressed RAR files playback. It is also a good 4K video player. 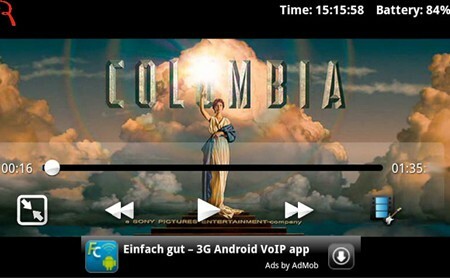 Note that the free M4V player for Android is ads supported. Sometimes, when playing M4V videos on Android at a faster speed, the video may lag behind the audio. MX Player scores four and a half stars out of five stars and is a highly recommended M4V player for Android after VLC media player. It allows users to play M4V videos on Android with many advanced options, such as speeding up slow performance phones, subtitles download, zooming in/out to change text size. With hardware acceleration and multi-core decoding, the best M4V player for Android delivers super video playback performance. There may be some problems with M4V playback on new Android devices like Samsung Galaxy S8. Common issues reported by users include ads, unexpected crashes, and fast battery drain. AllPlayer Video Player embraces lots of features that an advanced M4V player for Android should have, for example, hardware acceleration, subtitles download, movie info automatic download, advanced OSD. The M4V player for Android plays tons of other video formats on Samsung Galaxy, HTC, Huawei, LG and other Android phones tablets, including MP4, AVI, MOV, FLV, M2TS, RMVB, QuickTime formats and more. UI needs improvement for better M4V video playback experience. It lacks aspect ratio settings that can be found on other most-downloaded M4V player for Android like MX Player. Video Player All Format is an M4V player for Android with an average rating of 4.8. You can find many nice features on the best free M4V player for Android - subtitles downloader, hardware acceleration, ability to cast M4V videos to Android TV with Chromecast, auto-rotation/aspect ratio/screen-lock options and more. It supports nearly all video formats you throw at it, including M4V, MKV, AVI, MP4, FLV, M2TS, RMVB. The M4V player for Android also works as a wonderful 4K video player. But some UHD videos may stutter when playing on the M4V player for Android. There's a way to play M4V on Android with any built-in player for Android without format compatibility issues or choppy, stuttering M4V playing problems - using a solid M4V converter like MacX Video Converter Pro. The tool helps convert M4V to AVI, WMV or MP4 etc. Android supported formats. without losing video audio quality. Besides, the video converter for Mac/Windows allows users to compress M4V files to save space for Android phones and tablets, change aspect ratio, add subtitles, adjust video resolution etc. that M4V players for Android can't do. Step 1: Click Add Video and select M4V video files from your computer. Batch M4V conversion is supported. The M4V video converter will load files quickly. Step 2: On the Output Profile window, choose an output format for Android. You can convert M4V to AVI, MP4, WMV or Android devices. On the left side, click General Profiles and select MP4 Video, or Android Phone/Pad, or WMV Video. Or click Android Mobile under Device Profile, and select convert M4V video to HTC, Samsung, Google, Huawei, or other Android mobile devices. Click OK to save the output format. Tips: Click settings icon to get more video and audio options. You can compress M4V, change video audio codecs, convert frame rate/bit rate, adjust video aspect ratio, alter video resolution etc. for better M4V playing effect. Step 3: Click RUN button to start M4V to Android conversion and play M4V on Android without issues using any free M4V player for Android. Note: Some users who have purchased movies from iTunes would find that these iTunes M4V movies are not playable on Android devices. iTunes movies always come with DRM copy protection. If you are one of them, try MacX MediaTrans, a robust DRM removal tool and file transfer & converter, to remove DRM from iTunes and convert iTunes DRM M4V to MP4 for later playing on Android without DRM M4V videos not playing errors. Free download M4V video converter to convert iTunes M4V to MP4, AVI, MWV etc. with 5X faster speed to play M4V files on Android without format issues. It also helps change aspect ratio, compress large M4V files to a smaller file size, adjust video audio frame rate/bit rate, convert video resolution etc. for Android.